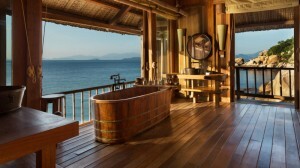 “The World’s Most Opulent Outdoor Bathtubs” Bob liked the Bali bathtub, which looks like a private pond. It includes a waterfall and shower. Joy favored the handcrafted tub looking out on the East Vietnam Sea.